Swivels to you for close & safe sleep. 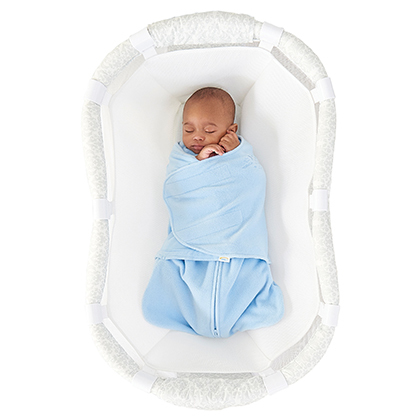 Bring your baby home to the only bassinet that swivels 360°. Now you can sleep as close as you want to your little one while he’s safe in his own separate space, as recommended by the American Academy of Pediatrics. And, the more it moves, the less you do – which makes caring for your baby throughout the night easier. 360 degree swivel motion brings baby close. Makes nursing and tending to baby from bed easy. Its sidewall lowers with a gentle touch and returns automatically to an upright position for safety. It can be locked in the upright position, if desired. Easy to see and easy to soothe. Swivel makes it easier to get in and out of bed. 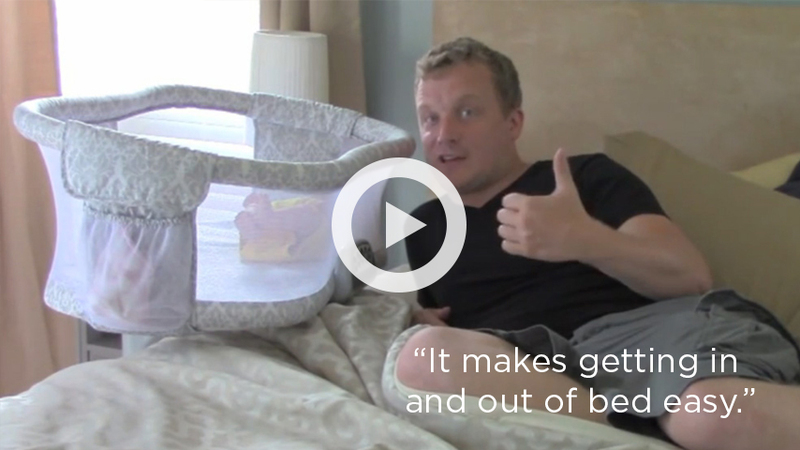 No need to scoot to the end of your bed and around a stationary bassinet. Includes nightlight, 3 lullabies, 3 nature and 3 womb sounds, 2 levels of vibration and a back to sleep reminder. Soothing Center available on select models. Stable 4-point base adjusts to fit most beds. Fits beds 24 to 34 inches (56 to 86 cm) tall. Space saving design tucks under your bed. Requires only 45 inches (114 cm) clearance. 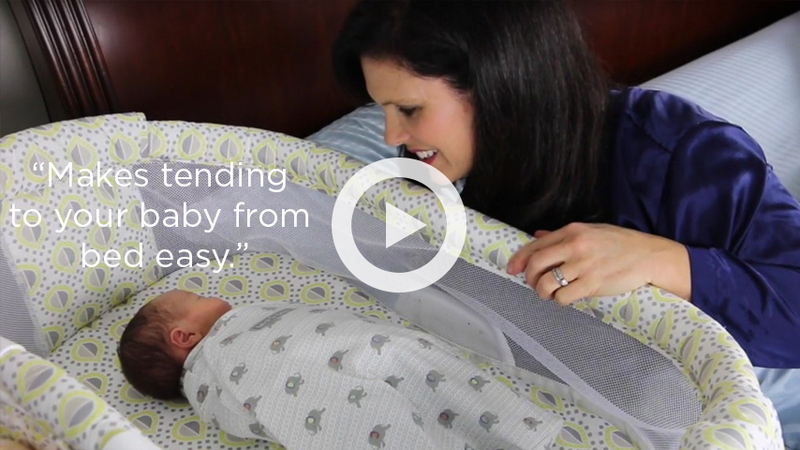 The Bassinest is a game-changer! 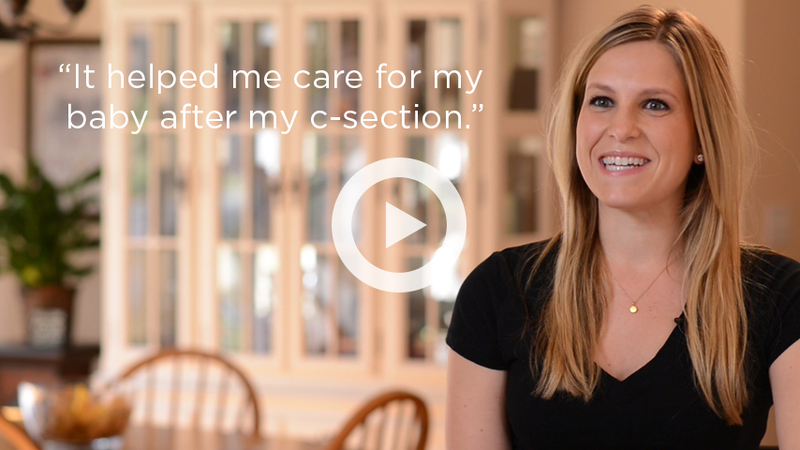 This is a game changer for new moms, especially c-section recovering moms. It’s hard enough getting up in the middle of the night, but when your mobility is hindered after a major surgery; it makes nursing and feeding sessions even harder. When all you have to do is sit up and swivel your bassinet to reach your baby, it makes feeding sessions a whole lot easier. I would highly recommend without hesitation! With a heavy base, the Bassinest will never accidentally topple over, providing a secure sleep environment for a new baby. 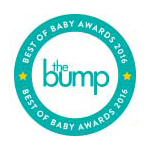 However, the base is still compact, requiring only 32 inches of clearance, meaning the Bassinest is ideal for smaller spaces. The adjustable height means the Bassinest fits perfectly almost any bed, and the swivel action allows a parent to easily get in and out of bed. Mesh sides provide another safety feature while keeping a baby at eye level. 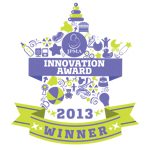 Other little features such as a storage pocket and a timed light show that HALO goes above and beyond in designed products for babies that parents trust. 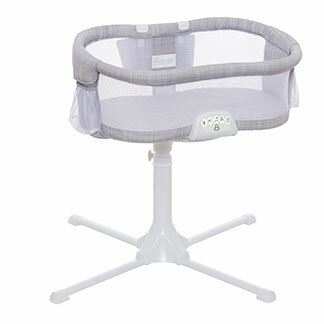 I highly recommend the HALO Bassinest Swivel Sleeper to any parent wanting to share a room with a new baby. It helped me get more sleep and have an easier recovery! 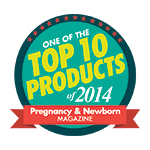 This product was really helpful in my recovery after my C-section. I love how it can adjust to your bed and come right up next to you even over the mattress. I could swivel the Bassinest out of the way to get out of bed instead of scooting (which would be painful due to my C-Section) to get off the bed. I love how I can set my baby in the Bassinest because the arm retracts, this was helpful so I wasn’t using my stomach muscles to lift or set my baby down. The Soothing Center was very helpful too. I use the nightlight often, which was great because I didn’t have to get up and turn the bedroom light on. I also love the vibration, which soothes my baby back to sleep. I would definitely recommend this product! It helped me get more sleep and have an easier recovery! 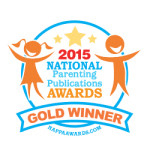 Of all the baby things we’ve accumulated over the years, THIS is the one thing my husband and I absolutely love! For our first, we used a full-size co-sleeper. While we definitely liked it and used it, we had no idea how much better life could be, until now. The main difference between the two is all the ways you can move and swivel the bassinet: away from the bed, closer to the bed (vs stationary and anchored to your bed). Now, I don’t have to scootch all the way to the bottom of the bed to go to the bathroom in the middle of the night anymore! I was worried I would lose the ease of an attached cos-leeper with breast feeding, but the retractable side takes care of that. Did I mention I can easily get out of bed by simply swiveling the bassinet outward? There’s a vibrating button, a music button, a light button… even a button to gentle wake you, should you dose after feedings. We’ve had the Bassinest for about a month and so far, no complaints. I wish we could use this longer, but at the rate this kid’s growing, we’ll probably be done next month. Definitely worth it. 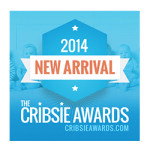 This is a must-have to include on your baby registry or baby wish list! I love the swivel feature! This feature enables you to get in and out of bed effortlessly, make the bed and more importantly, brings my baby to within easy reach. I wish I had the Bassinest when I had my first child. This is a must-have to include on your baby registry or baby wish list. It creates a safe and comfortable sleeping environment for the baby while being a huge convenience for both mom and dad. 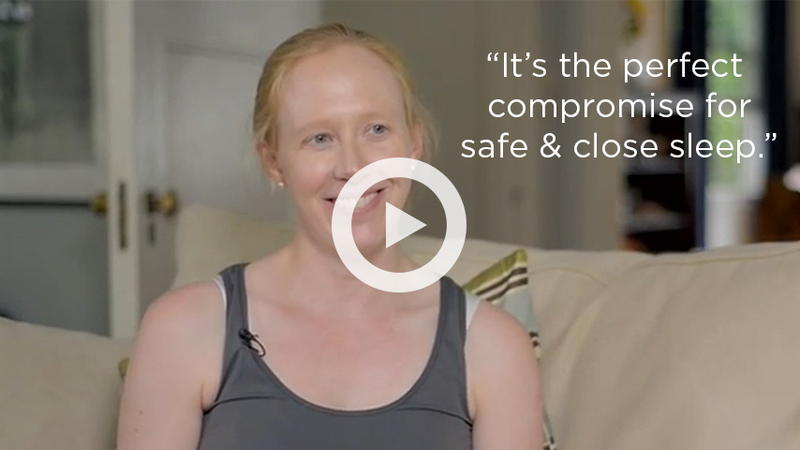 A safe, portable nap space makes for a happy, busy mama. The new HALO Bassinest portable stand lets you bring the Bassinest anywhere in the house. Naptime just got easier. 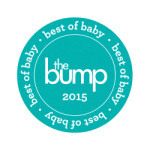 Provides a narrower sleep surface to help your newborn transition from the womb to the Bassinest and feel more secure.